Quests for cod, herring and other sea fish had profound impacts on medieval Europe. This interdisciplinary book combines history, archaeology and zooarchaeology to discover the chronology, causes and consequences of these fisheries. It crosscuts traditional temporal and geographical boundaries, ranging from the Migration Period through the Middle Ages into early modern times, and from Iceland to Estonia, Arctic Norway to Belgium. It addresses evidence for human impacts on aquatic ecosystems in some instances and for a negligible medieval footprint on superabundant marine species in others (in contrast with industrial fisheries of the 19th–21st centuries). The book explores both incremental and punctuated changes in marine fishing, providing a unique perspective on the rhythm of Europe’s environmental, demographic, political and social history. The 21 chapters – by experts in their respective fields – cover a range of regions and methodological approaches, but come together to tell a coherent story of long-term change. Regional differences are clear, yet communities of the North Atlantic Ocean and the Baltic, North and Irish Seas also followed trajectories with many resonances. Ultimately they were linked by a pan-European trade network that turned preserved fish into wine, grain and cloth. At the close of the Middle Ages this nascent global network crossed the Atlantic, but its earlier implications were no less pivotal for those who harvested the sea or profited from its abundance. "This is an important volume, not only for those already interested in fishery history, but for those interested in the development of commercial activity in the Middle Ages and in the social history of diet … It is (as its editors, James H. Barrett and David C. Orton, rightly say) a ground-breaking volume in its combination of archaeological and documentary evidence and the new application of stable isotope analysis to archaeological deposits." "… [an] outstanding collection of articles that point the way forward in collaborative interdisciplinary marine historical ecology in the North Atlantic." 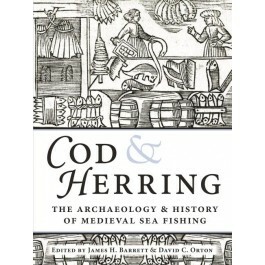 "Cod and Herring is a specialised volume, but crammed with fascinating detail that will reward the general reader." "…this collection of essays is likely to become an important marker buoy…"
"Despite the large range, the volume has great coherence, expertly walking the reader through the key issues and providing insights into marine fisheries on a pan-European scale. Overall, the volume is an impressive compilation encompassing the work of a large number of specialists, and provides what researchers will doubtless use as a future framework for investigating marine exploitation during this era."